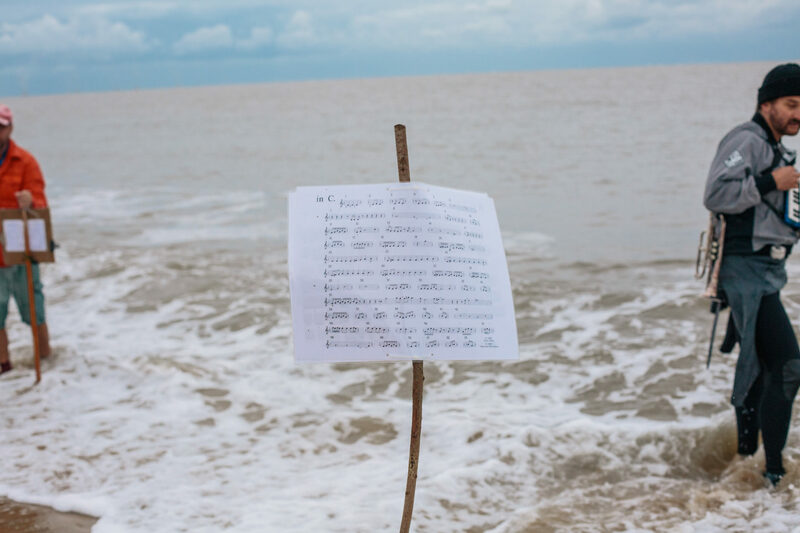 Dip your toe into the world minimalism and the north sea at the same time with our open air performance of Terry Riley’s In C, in the sea. 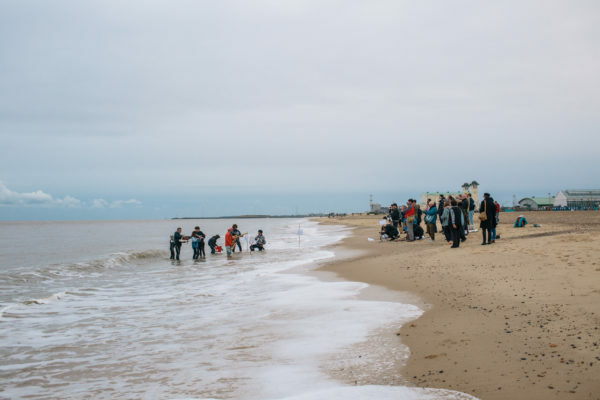 On Saturday 21st September 2018 our young peoples ensemble waded into the choppy waters at Yarmonics festival. Composed by Terry Riley in 1964, In C is often cited as the first minimalist composition. for an indefinite number of performers. Written as a series of short melodic fragments, he suggests “a group of about 35 is desired if possible but smaller or larger groups will work”. Every musician starts of phrase 1 and ends on phrase 53, taking as long or short as they wish on each section before moving on. Being fans of terrible puns at CLIP, we joked about finding a way of playing In C but actually in the sea… then thanks to an oportunity from Kaavous at Yarmonics Festival we set about actually contemplating what this would mean. 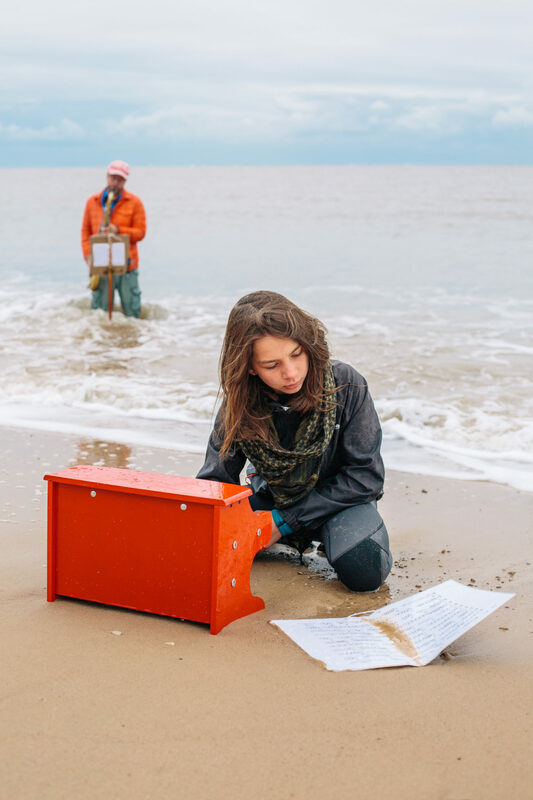 The choppy waters of the North Sea / Great Yarmouth Beach offered a variety of challenges, from sourcing acoustic (or battery powered) instrumentation to laminating the scores and of course considering how to keep dry throughout. The beauty of In C is that even if you can’t read music, theres still provision within the programme notes for percussionists / rhythm-section to be the driving pulse through the performance. Keeping everybody in time as their phrases overlap creating polyrhythmic patterns. Thanks to our funding from Youth Music, we offer weekly (term time) sessions at Firstsite in Colchester. Although we recommend a minimum age of 14 we have no upper age limit meaning the group is often intergenerational. 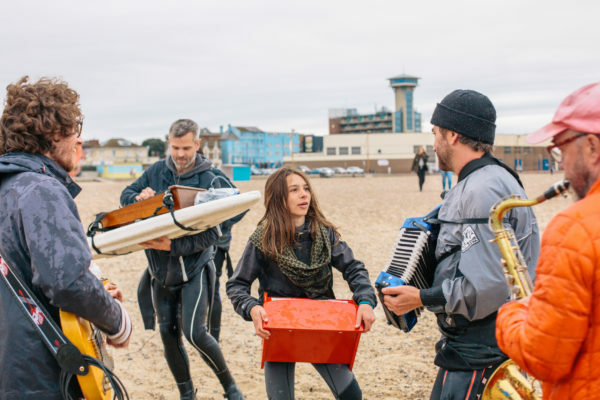 Giving us fantastic jamming sessions between all ages, allowing for skill sharing and mentoring from a variety of figures. Creating once-in-a-lifetime performances opportunities like this is key to CLIPs success. Encouraging young musicians to take creative risks, whilst offering them plenty of opportunities and a support net beneath them to “fail” also. Despite a few hiccups on the day, the feedback from both the performers and the audience was overwhelmingly positive, with some even calling it the performance of the festival! ”The performance was one of my favorite things in the festival, and left me a sense of hope and peace!